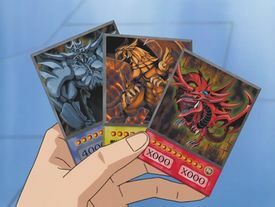 From left to right: "Slifer", "Ra" and "Obelisk"
The Egyptian God Cards, also known in Japanese as the Three Legendary Gods (三（さん）幻（げん）神（しん）, Sangenshin), are a series of cards in Yu-Gi-Oh! that serve as a focal point in the series' manga, the second series anime, and numerous video games. Currently, the only cards that supports this series are "Ra's Disciple", "Mound of the Bound Creator", and "The True Name". Several other cards, such as "Embodiment of Apophis", "Mystical Beast of Serket", "Ma'at", the "Horus the Black Flame Dragon" archetype, "Sebek's Blessing", "Sacred Phoenix of Nephthys", the "Hieratic" archetype, and the "New Order" archetype, are named after real Egyptian deities, but are not a part of the Egyptian God series. The "Egyptian Gods" are one-of-a-kind all-powerful cards created by Maximillion Pegasus, who modeled them after three Ancient Egypt divine beasts whose likenesses surround the Millennium Puzzle on the stone tablet said to hold the memories of the nameless Pharaoh. According to Ishizu Ishtar, they are believed to represent the polarities of the universe. When Pegasus decided to make them into cards, everyone involved in the project was attacked by the spirits of the "Egyptian God" monsters, so Pegasus decided to create the cards on his own, under the protection of his Millennium Eye. When Pegasus finished the art-work on the prototypes, he had a nightmare about the Egyptian Gods attacking him. Shadi told Pegasus that he had angered the "Egyptian gods". Pegasus woke up injured after this "nightmare," so he decided that these cards were too powerful to be mass-produced, and had Ishizu Ishtar bury the prototypes in the Pharaoh's tomb. The wielder of these great cards is able to acquire the title of "Duel King," but in the wrong hands, they are capable of causing legitimate injury or even death. Using counterfeits of the "God" cards also proved to be deadly, as Marik Ishtar found out when his Rare Hunters were testing counterfeited copies of "The Winged Dragon of Ra", some ended up being crippled, some lost their minds, and some even died the moment the card was played. Marik came to the conclusion that the "Gods" respond to the strength of heart of the Duelists, of which none of the members of the experimental group had, and to this end, he gave Odion a copy of "Ra", reasoning that he would be able to control it due to his past as a servant of the Tomb Keepers. Unfortunately, this proved to be incorrect, resulting in both Duelists being struck down. Marik was able to acquire "The Winged Dragon of Ra" and "Slifer the Sky Dragon", but Ishizu was able to protect "Obelisk the Tormentor". She gave the card to Seto Kaiba, and requested that he host a Dueling tournament to lure Marik and his Rare Hunters to the city, bringing the other "God" cards with them. Kaiba, intent on claiming the cards for himself to secure his title as the strongest Duelist, agreed and hosted the Battle City tournament. During the tournament Marik revealed to Yami Yugi the "God" cards and that the Millennium Puzzle were needed to unlock his lost memories. Marik used "Slifer the Sky Dragon" against Yami Yugi through Strings, but Yami Yugi was able to defeat "Slifer" and took it for himself in accordance with Battle City's ante rules. Kaiba reveled in the power of "Obelisk the Tormentor" after testing it against his own Deck, and he used it throughout the tournament against Koji Nagumo and several Rare Hunters, including Lumis and Umbra. During the tournament quarterfinals, Yami Yugi used "Slifer" for the first time to defeat Yami Bakura. Marik had placed a copy of "The Winged Dragon of Ra" in Odion's Deck without his knowledge, telling him that usage of the card against Joey Wheeler was needed to prove to those watching that Odion was Marik, as Marik was keeping his identity a secret. After Odion was struck down by "Ra's" rage for using a counterfeit of its card, Marik was taken over by Yami Marik, who Dueled Mai Valentine in the next round. Mai successfully took "The Winged Dragon of Ra" from Yami Marik's Deck with "Amazon Chain Master" and Summoned it, but was unable to read the hieratic text on the card one needed to recite to control it. On his next turn Yami Marik did so himself and took back control of "Ra" to win the Duel. In the final round of the quarter-finals, Kaiba faced Ishizu who had entered the tournament to save her brother and reclaim "Obelisk" from Kaiba. Using her Millennium Necklace to foresee Kaiba's moves, Ishizu allowed him to Summon "Obelisk" with the intent to destroy it "Blast Held With a Tribute", but a vision from Yami Marik's Millennium Rod convinced Kaiba to win using his "Blue-Eyes White Dragon", thwarting Ishizu's strategy. In an unofficial fifth Duel later that night, Yami Bakura Dueled Yami Marik, and Bakura seized "The Winged Dragon of Ra" with a combination of "Dark Designator" and "Exchange", and with the help of the spirit of the original Marik was able to Summon and control Ra. However, Yami Marik sapped "Ra's" ATK to 0 with "Joyful Doom" and when Bakura abandoned "Ra" later in the Duel, Yami Marik revived it with "Monster Reborn" and revealed its secret abilities Instant Attack and Point-to-Point Transfer) to win the Duel. The Egyptian God Cards did not appear during the Virtual World arc, since the Big Five had the cards forbidden from their database that was used to choose a player's Deck. Marik and Joey Dueled in the semi-finals, and Yami Marik unveiled "Ra's" Phoenix Mode, burning Joey and wounding him so badly he fell unconscious and was unable to finish the Duel. In the next Duel, Kaiba and Yami Yugi faced each other and eventually both got their "God" cards on the field. After several turns of the two weakening and powering up the two cards, they equaled at 4000 ATK and destroyed each other, the clash triggering a vision of the Duel between Priest Seto and Pharaoh Atem in Ancient Egypt, and a vision of their two Gods petrified. Yami Yugi was eventually able to win the Duel with "Dark Paladin", claiming "Obelisk". In the final Duel against Yami Marik, Yami Yugi used both "God" cards to battle him, but it was revealed "Ra" was stronger than both the other "God" cards and it destroyed "Slifer" with ease and eventually forced Yugi to sacrifice "Obelisk" to survive. Nonetheless Yami Yugi eventually won by using "Ragnarok". In the manga, Yugi used "Dimension Magic" to have two Magicians on the field, then the second effect of "Dimension Magic" makes Yugi combine the attacks of his two Magicians and destroy "Ra" in battle. As Yami Marik was fused with "Ra" at the time, this allowed Marik to regain control of his body from his dark half. Marik surrendered the Duel to Yugi, and gave him "Ra". In the Waking the Dragons season, Yami Yugi attempts to use the "God" cards to unlock the Tablet of Lost Memories, but it is iced over by the power of Dartz, preventing him from regaining his memories. The "God" cards are later stolen when Solomon Muto is caring for them by Dartz's underlings. "Obelisk" was briefly used by Gurimo against Yami Yugi and though it was successfully controlled by "The Seal of Orichalcos" the combination caused Gurimo to suffer discomfort. After Gurimo's defeat, the God cards were taken to Dartz's temple, where they were drained of their energy to fuel the Great Leviathan. They are retrieved at the end of the season and empowered with the light of Dartz's captives to battle the Great Leviathan in physical form, defeating it decisively. In the Memory World arc, Yami Yugi uses the "God" cards to enter the world of the Pharaoh's memory. Here, acting as Atem in what is actually an RPG-type Shadow Game orchestrated by Yami Bakura, Yami Yugi battles Thief King Bakura and his Diabound with the "God" monsters one by one. "Slifer" is destroyed by Diabound, resulting in Diabound gaining its power, but "Ra" successfully destroys Diabound. However, as the Summoning of "Ra" was as a result of outside interference from Yugi, Yami Bakura used his ability as a player of the Shadow RPG to rewind time and prevent the Summoning of "Ra". Yami Yugi later Summons the Gods to battle Zorc Necrophades, apparently defeating them, but Zorc petrifies the Gods, badly injuring the Pharaoh. Upon learning his name, Yami Yugi/Atem uses it to merge the "Gods" into "Holactie the Creator of Light", destroying Zorc and winning the Shadow RPG. Afterwards Yami Yugi used the "God" cards again against Yugi Muto in the Ceremonial Battle, Yugi destroying the cards by turning "Slifer's" effect against the "God" cards with "Magnet Force" (in the manga, Atem only Summoned Obelisk, but it was weakened, and Yugi's "Silent Swordsman" was strengthened, making both their ATK 2500, then, when Obelisk attacked, they were both destroyed). In the Duel's final move, Yami Yugi attempts to revive "Slifer" with "Monster Reborn", but Yugi had foreseen this and sealed "Monster Reborn" with "Gold Sarcophagus", allowing him to win the Duel. The three "God" cards were then lost forever when the tomb collapsed, burying the seven Millennium Items along with the cards when Atem left for the afterlife. In Yu-Gi-Oh! The Dark Side of Dimensions, Kaiba pulls "Obelisk" out of the ground during his Duel against Aigami, and used it to defeat him. In Yu-Gi-Oh! R, the "Wicked Gods" are introduced, used by Pegasus's protégé Yako Tenma; Yako claimed them to be the twins of the three "Egyptian God" cards, and that Pegasus himself was too afraid to produce them, but Yako completed them based on Pegasus's designs. 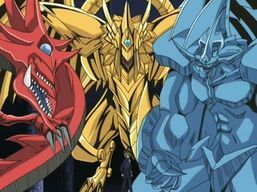 The "Egyptian Gods" themselves made only brief appearances in the series, with "Slifer" being destroyed by "The Wicked Avatar" in Dark Yugi's first Duel with Yako and later being used to offhandedly dispatch Cedar Mill;" "Ra" being briefly Summoned in the second Duel with Yako to destroy "The Wicked Dreadroot," though ultimately, Yako negated the Summon; and "Obelisk" to clash with "Avatar" in the final Duel with Yako, matching its ATK and destroying them both after being made equal on the Divine Hierachy as "Obelisk The Progenitor." In Yu-Gi-Oh! The Movie: Pyramid of Light, the three "Gods" combine to form a monster with infinite strength. This allowed Yugi to destroy Anubis' "Theinen the Great Sphinx" with an ultimate attack, "Titan Firestorm," and win the Duel. In the Japanese version of the second series anime, this is the equivalent of "Obelisk's" "Soul Energy Max" ability, which, as alluded to by Seto Kaiba, was a "miracle of God's anger." In Yu-Gi-Oh! GX, the dorms of Duel Academy are named for the "God" cards - Slifer Red, Ra Yellow and Obelisk Blue. The series also introduces the Sacred Beasts, evil and twisted versions of the "God" cards. Pegasus confirms the "God" cards are gone. Presumably when Yami Yugi departed to the afterlife after his Duel with Yugi, he took the "God" cards with him. A copy of "The Winged Dragon of Ra" that Industrial Illusions created for testing purposes is stolen by a disgruntled card designer named Franz, who later Duels Jaden Yuki. The abilities of the card as far as immunity goes is not fully disclosed. There is a trend in GX for monsters of significant importance, to simply receive blanket immunity from all Spell, Trap and Monster Effects (e.g. "Exodius the Ultimate Forbidden Lord"). This version of "Ra" was also able to activate its Point-to-Point Transfer and Egyptian God Phoenix abilities if it has been Tribute Summoned. Jaden is able to defeat Franz and the copy of "Ra" is returned to Pegasus. In the final episode when Jaden Duels Yugi, "Slifer" is summoned. In Yu-Gi-Oh! 5D's, the "God" cards are briefly mentioned in episode 121 by Taro, when he compared the power of "Zushin the Sleeping Giant" to that of the "Egyptian Gods". In Yu-Gi-Oh! ARC-V, Duel Academy's invasion soldiers are called "Obelisk Force", and bear masks similar to the face of "Obelisk the Tormentor". The dub also maintains the dorms seen in GX It is unknown why they are named after "Obelisk" in this series, as no mention of the Egyptian God cards' existence has been made. "Slifer the Sky Dragon" (「オシリスの天（てん）空（くう）竜（りゅう）」 Oshirisu no Tenkūryū - Sky Dragon of Osiris) - Original name derived from the name of Osiris, the Egyptian God of Life, Death, and Fertility. The English name is an inside joke, derived from the name of Roger Slifer, a producer of the English-language adaptation to the anime. It represents the polarity of good and evil. "Obelisk the Tormentor" (「オベリスクの巨（きょ）神（しん）兵（へい）」 Oberisuku no Kyoshinhei - Giant God-Soldier of Obelisk) - Derived from the term "obelisk," a type of monument. It represents the polarity of light and dark. "The Winged Dragon of Ra" (「ラーの翼（よく）神（しん）竜（りゅう）」 Rā no Yokushinryū - Winged God-Dragon of Ra) - Derived from the name of Ra, the Egyptian God of the Sun. In the Filipino anime, Ra's name is changed to "Apollo", the Greek equivalent of Ra. It represents the polarity of heaven and earth. In the English manga, they are all often simply referred to as "God," though their original names are still used. The names of the "Egyptian Gods" are the basis for the names of the dormitories of Duel Academy in Yu-Gi-Oh! GX; Slifer Red, Ra Yellow and Obelisk Blue. This also reflects how Seto Kaiba viewed the three "Egyptian god" cards; "Slifer" was owned by Yugi Muto, his arch-rival, so it was only natural that he holds the card in such contempt. "The Winged Dragon of Ra" is in the middle, since it was owned by Marik Ishtar, until Yugi won it from him in Battle City; Seto Kaiba was thus neutral to this card. Of course, with Obelisk Blue, it was plainly obvious why he based this dorm off of "Obelisk The Tormentor"; it was the first and only "Egyptian God" card he received, and indeed seen the power it holds, until Yugi won it from him in the Battle City Finals. In Yu-Gi-Oh! ARC-V, the Fusion Dimension Duel Academy has an elite squad of Duelists called the Obelisk Force. These Duelists wear helmets based on the head of "Obelisk the Tormentor". All three "Egyptian God" Cards share similar effects, though the exact specifications differ slightly between the anime and the manga. Only chosen Duelists linked to the ancient past may control a "God" card, though "Obelisk the Tormentor" was successfully used by a Duelist using "The Seal of Orichalcos", albeit not without discomfort. Each card requires a Tribute of 3 monsters in order to be Normal Summoned/Set from your hand to the field. Their Battle Position can be changed on the turn they were Normal Summoned. If they are Special Summoned from the Graveyard or Banished area, they are returned to the Graveyard or Banished area at the end of the turn. If they are Special Summoned in Defense Position when your opponent has attacked with a monster, you may switch the attack target to them. They cannot be Tributed by your opponent. Control of the cards cannot change. The opponent cannot equip cards to the "God" Cards. They cannot be returned to their controller's hand. They cannot be destroyed by card effects of non-"God" Cards. However, it seems they can be removed from play (as Yugi removed from play "The Winged Dragon of Ra" with "Ragnarok"). Card effects that negate their effects last for as long as the card is face-up on the field. All other card effects used on them only affect them for the remainder of the turn they were activated. In episode 94 of Yu-Gi-Oh! "Ishizu" attempted to destroy "Obelisk" with the effect of "Sacrifice's Blast" (a.k.a. "Blast Held by a Tribute"). Their effects are much more clearly defined in the original manga. They require three Tributes due to being Level 10 monsters (under the Duelist Kingdom rules, Kaiba was shown Summoning "Obelisk" without any Tributes, just like any other monster). Their attacks do not trigger the activation conditions of a Trap Card that needs to be activated in response to an attack. They are unaffected by most effects that would directly remove them from the side of the field of their controller, except for the abilities of a God with the same Hierarchy and the effect of "Dimension Magic" (since the monster destroyed by "Dimension Magic" counts as being destroyed by battle rather than by a card effect). Any other card effects only affect them for one turn (which is why they return to the Graveyard after one turn if they were Special Summoned from there). They possess a Hierarchy among themselves. This is explained as a pyramid, with "Ra" being at the top, and "Slifer" and "Obelisk" at the base (as equals). Because of this, the effects of "Slifer" and "Obelisk the Tormentor" do not work on "Ra". The effects of "Obelisk" and "Slifer" will work on each other, for one turn. The "Wicked Gods" belong to this same Hierachy. The effects of "Obelisk" and "Slifer" are treated as both effects and attacks in the manga and anime. In the manga, both of their effects fail to destroy "The Sun Dragon Ra" due to Hierarchy, meaning that they count as effects. In the anime, "Magnet Force" was able to redirect "Slifer's" effect, indicating that it is an effect (and that it targets). Furthermore, in the anime and manga, Summoning "Kuriboh" while "Nightmare's Steelcage" was active did not trigger "Slifer's" effect, indicating that it is an attack. 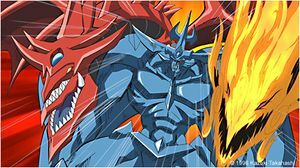 It is sometimes said that in addition to their Divine-Beast Type, "Obelisk" is a Warrior, "Slifer" is a Dragon, and "Ra" is a Machine. The three are classified as these Types in various video games such as Yu-Gi-Oh! The Sacred Cards and Yu-Gi-Oh! Reshef of Destruction. In the anime and manga, Yugi's "Buster Blader" gains 500 ATK due to "Slifer" being a Dragon-type, and "Obelisk" is used by Gurimo, a Duelist who uses a Warrior Deck. Although in the manga and anime the god cards are immune to most Spells and Traps, and others are dampened to one turn effects, there are certain cards that have power to override this, affecting the god cards for as long as they remain on the field. "Obelisk" gained a boost in ATK from both the "The Seal of Orichalcos" and "Divine Evolution", the former which was an ancient power that surpasses the Egyptian Gods, while the latter was designed specifically for god cards. "Mound of the Bound Creator" was designed to bound god's power to those not chosen, even if it is a copy god card. In the Basic Game Play FAQ on the Former Official UDE Web Site there was a question that asked "What do the Egyptian god cards do?" and it was answered with "Nothing. They're not legitimate Yu-Gi-Oh! Trading Card Game cards. They have no effects and can't be used in your Deck." Increase its ATK to ∞ as well as attack any number of monsters the player chooses, regardless of whose turn it is. After it has attacked, the ATK of "Obelisk" returns to its original value. The anime and other media had another option, which was destroying all the opponent's monsters allowing "Obelisk" to attack directly instead of gaining ATK (this was apparently the explanation used when Kaiba activated the effect against Yami Yugi). This ability was used only once in the manga continuity, when Kaiba Summoned "Obelisk" during his Duel against Aigami. The ATK and DEF is the number of cards held by the Duelist x 1000. When an opponent Summons a monster, it attacks that monster immediately, reducing that monster's ATK or DEF by 2000, depending on if it is in Attack or Defense Position. If that monster's ATK or DEF is 2000 was reduced to 0 as a result, it is destroyed. The ATK and DEF are equal to the combined respective ATK and DEF of all monsters Tributed to summon it. When Special Summoned, this card is immune to any card effects and conditions that would prevent it from attacking. When Special Summoned, the Duelist's option other than "Egyptian God Phoenix" mode is that the Duelist can pay all but 1 of their Life Points to increase the ATK & DEF of "Ra" by the same amount of Life Points paid. The Duelist can then choose to Tribute any other monsters they control to add their ATK & DEF to "Ra's" ATK & DEF. Also, it can attack all monsters the opponent controls, as well as attack directly afterwards. Under these circumstances, "Ra" is treated as a Fusion Monster, and if targeted by "De-Fusion" its ATK drops to 0 while the Duelist's Life Points increase by an amount equal to what "Ra's" ATK had been, then if "Ra" attacked, its attack is negated. The Duelist can Special Summon "Ra" as "Egyptian God Phoenix" where its attack cannot be negated, it cannot be destroyed by battle, you take 0 Battle Damage from battles involving it, and it is immune to all card effects. When "Egyptian God Phoenix" battles with a monster, the Duelist can pay 1000 Life Points to destroy that monster at the start of the Damage Step. The original prints of the Egyptian God Cards cannot be used in official tournaments due to their limitation text stating as such. They would otherwise also be illegal due to their backings, which would make them count as marked cards. In Japan, they were released as a pre-order bonus for the Japanese Game Boy Color game Yu-Gi-Oh! Duel Monsters 4: Battle of Great Duelist, which released on December 7, 2000. They were reprinting as pack-in cards for the Game Boy Advance game Yu-Gi-Oh! Duel Monsters International — Worldwide Edition (the Japanese version of the English-language Yu-Gi-Oh! Worldwide Edition: Stairway to the Destined Duel), which was released in Japan on April 17, 2003. "The Winged Dragon of Ra" was also included as a pack-in card with the Xbox game Yu-Gi-Oh! The Dawn of Destiny, released in Japan on March 23, 2004; "Slifer the Sky Dragon" was also released as a pack-in card with the ani-manga of Yu-Gi-Oh! The Movie: Pyramid of Light, published by Viz Media on November 23, 2004; "Obelisk the Tormentor" was also released as a Shonen Jump magazine subscriber promotional card in May 2005. The illegal prints were the only DIVINE monsters and the only Divine-Beast-Type monsters, prior to receiving legal prints. The illegal prints of the Egyptian God cards once demanded high prices on the secondary market. This was prior to their current widespread availability. During this time, countless counterfeit copies were made and distributed primarily throughout East Asia. They were originally released as promotional cards just for collectors, but players attempts to use the cards in Duels. In an FAQ, Konami stated that these cards could not be used in tournament play. After this statement, official tournaments stopped allowing these cards. According to Shonen Jump, they are Normal Monsters. All three of the Egyptian God cards have received legal prints as Effect Monsters. The legal "Obelisk" and "Slifer" possess effects virtually identical to their video game effects, while the legal version of "Ra" has its effects severely weakened (it cannot be Special Summoned, does not gain ATK equal to the total ATK of the monsters Tributed for its Tribute Summon, and its Point-to-Point Transfer effect has the player pay LP until they have 100 remaining rather than 1). The only immunity of "Obelisk" was that it cannot be targeted by card effects, whereas the two other "God" Cards can be destroyed by anything. Introduced in Duelist Pack: Battle City, "The Winged Dragon of Ra - Sphere Mode" circumvents some of the weaknesses that "Ra" has. "Sphere Mode" can be Normal Summoned by Tributing 3 monsters from either player's side of the field (being Summoned to the same side of the field as the Tributes), but will return to its owner's control at the end of the next turn. "Sphere Mode" cannot be attacked nor targeted by card effects. It can also be Tributed to Special Summon "Ra" from the hand or Deck and giving it 4000 ATK and DEF, thereby eliminating its main weaknesses (having no ATK or DEF points without paying excessive LP). "Sphere Mode" is also a DIVINE Divine-Beast-Type monster. Additionally, "The Winged Dragon of Ra - Immortal Phoenix", which can be Summoned if "Ra" is destroyed, can Special Summon "Sphere Mode" during the End Phase, which can be used to Summon "Ra" again, similar to how Yami Marik could endlessly revive "Ra". Legal version of "Obelisk the Tormentor"
Legal version of "Slifer the Sky Dragon"
Legal version of "The Winged Dragon of Ra"
Usually, it's more practical to focus a Deck on a single Egyptian God, since they are all significantly different and lack synergy. However, in a Deck focusing on "Holactie the Creator of Light" it is necessary to use all three. These cards require 3 Tributes to Normal Summon, so the Deck focuses on stalling and swarming to prepare monsters to serve as these Tributes. They prevent effects from being activated in response to their Normal Summon, and "Obelisk" cannot be targeted. Even though the "Egyptian Gods" are powerful, they can be stopped by many cards. Non-targeting effects (like "Hammer Shot") can easily destroy "Obelisk" (the only one who is immune to targeting card effects). Cards such as "Mask of Restrict" or "Ojama Trio" can make it impossible to Summon them, with the former preventing Tributes and the latter may limit the amount of tributable monsters to 2. You can use Honest so your attacking monster has sufficient ATK to destroy them. To deal with "Slifer" use card effects that force your opponent to discard cards from their hand. Last but not least, cards that negate their effects (like "Destiny HERO - Plasma") can be devastating (although "Obelisk" retains his 4000 ATK, as would "Ra" that has been Special Summoned by the effect of "The Winged Dragon of Ra - Sphere Mode"). You can Link Summon “Masterking Archfiend” with the effects of cards like “Phantom Skyblaster” and “Tour Guide from the Underworld”. You can pay the activation cost of the effect of a “Edge Imp Sabres” in the GY to put a card on top of your Deck, and then add the card to your hand with the effects of cards like “The True Name” and “Archfiend’s Oath”. You can easily get “Edge Imp Sabres” to the GY via 2 ways: • Special Summon it with the effect of “Tour Guide from the Underworld”, then send it to the GY via things such as using it as material for the Link Summon of “Masterking Archfiend” • Or you can send it from the Deck to the GY with “Masterking Archfiend” by paying an 800 LP cost (to match its 800 DEF), with cards such as “Psychic Blade” or “Brain Control”. Level 6 monsters like “Archfiend Commander” can be used as materials to Xyz Summon “Inzektor Exa-Beetle”, whose effect can make “The Winged Dragon of Ra” an Equip Card, that you can send to the GY, allowing you to Special Summon “The Winged Dragon of Ra – Immortal Phoenix”. In the Febuary 2012 issue of the V-Jump Magazine, a Deck was posted on how to Summon all three of the "Egyptian Gods" as well as "Holactie the Creator of Light". The "Egyptian God" cards are present in Yu-Gi-Oh! The Sacred Cards, Yu-Gi-Oh! Reshef of Destruction, Yu-Gi-Oh! Nightmare Troubadour, Yu-Gi-Oh! GX Spirit Caller and Yu-Gi-Oh! GX Tag Force 2. In Tag Force 2, they can be obtained only if the player has the original Yu-Gi-Oh! GX Tag Force UMD Disc. In Yu-Gi-Oh! GX Tag Force 3, they can be obtained only if the player has Yu-Gi-Oh! GX Tag Force 1 and 2. In Spirit Caller, the game must be connected with Nightmare Troubadour in order to obtain them. Since it is possible to "trade" between Nightmare Troubadour, Spirit Caller and Yu-Gi-Oh! World Championship 2007 by buying cards from Nightmare Troubadour, it is possible to have the "Egyptian God" cards in any of these games. Additionally, in Spirit Caller, the player can see the "Egyptian God" Cards by unlocking Yami Yugi. In Yu-Gi-Oh! World Championship 2008, they can only be obtained via the Card Download function, like with "Thunder King Rai-Oh". In Yu-Gi-Oh! 5D's World Championship 2009: Stardust Accelerator, "Obelisk" is an Effect Monster, but "Slifer" and "Ra" are their own individual Monster Card types, unseen in the game's navigational menus. They are all Level 10, DIVINE Attribute, Divine-Beast-Type, and cannot be targeted by cards or effects. The Summon of an "Egyptian God" card cannot be negated, and cards cannot be activated in response to their Summon. Each "Egyptian God" card requires three Tributes to be Normal Summoned, and cannot be Set. If Special Summoned, they are destroyed during the End Phase. In the original manga and the Japanese anime, the card text of the Egyptian Gods (except the Hieratic Text of "The Winged Dragon of Ra") is written in English, likely due to the one-of-a-kind cards being created by an American. This page was last edited on 10 March 2019, at 08:36.